Youngevity Y-DR8+T Water Bottle – Buy 12, Get 1 Free Now, when you purchase 12 Y-DR8+ bottles, you get another one FREE! Y-DR8+T, Youngevity’s most anticipated new product, is an on-the-go custom hydration and filtration system. Designed to improve the taste and odor of municipal drinking water, saving you money and help save the environment from single serve water bottles. Y-DR8+ proprietary custom hydration system allows you to filter Y-DR8+ municipal drinking water, providing better-tasting municipal drinking water, and helps reducing the following chemicals: chlorine, herbicides and pesticides from municipal water sources. 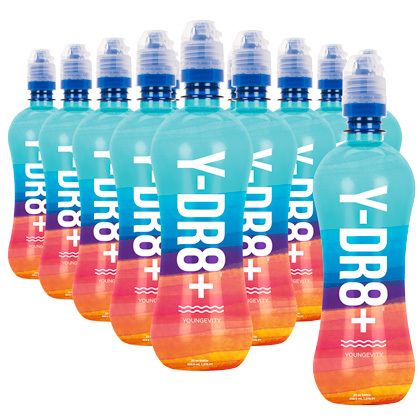 Y-DR8+ is convenient, environmentally-friendly, and healthy! -The filter is rated for two weeks or approximately 20 gallons. Usage is based on hydration with 3 Y-DR8+ bottles a day for 14 days. * – Could save up to $98/mo on bottled water and reduce single serve bottles by 90 bottles a month – PET . BPA Free . Phthalate Free . Reusable . Recyclable – Improves taste of municipal drinking water by reducing chlorine – Remove filter to use bottle with Youngevity powder products – Great business opportunity; bottled water is a billion dollar market The Filter provides portable point of use filtration, so keeping the Y-DR8 bottle System with you at all times will gives you access to inexpensive, great tasting, filtered municipal water wherever you go. Keep additional bottles at work and in your car so that you will always have access to better tasting, filtered municipal water. There is no need to waste money on bottled water again! Filter is designed to meet NSF 42 International standards for chlorine, taste and odor reduction. Filter has been tested per EPA drinking water quality standards. Filter designed for municipal tap water only. Substances reduced may not be in all users’ water. Expended Filters are recyclable, the filter can be recycled through most local community recycling programs, further reducing any carbon footprint. The Bottle is designed for multiple uses. A single Bottle could replace up to 300 water bottles thrown into landfills and oceans.